We recently introduced a new and exciting fruit to the classroom- Mango! The yellow fruit has sparked a great deal of interest in the students, launching many a conversation and opportunity for exploration. After conducting investigations of the inside and outside of the mangos, the students began a yellow color exploration. Throughout the week, the children compared and matched other yellow objects that could be found in the room. A few of these materials were Legos, flowers, play dough and paint. Conducting comparisons between objects is important because it encourages close attention to detail and engages problem-solving skills. Making simple comparisons between physical properties lays a solid foundation for discovering commonalities between more complex concepts in the future. Students used the yellow paint to mimic the inside of the fruit. 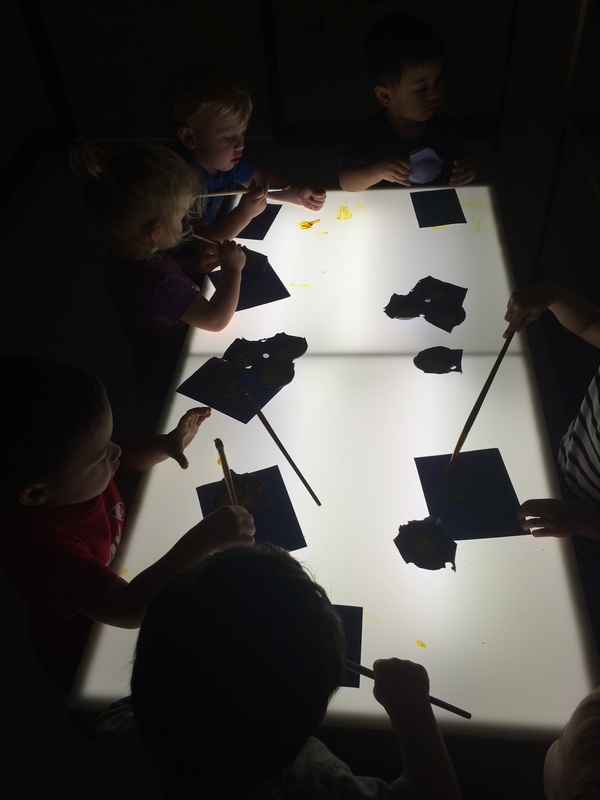 They used the paint in both the classroom and at the light table, allowing them to examine how different lighting impacts a color’s appearance. The play dough was useful for constructing models of the other yellow objects the children observed. Even the play dough containers were used! Creating models of the items that the children compared required problem solving along with a great deal of imagination and creativity. Creating their own interpretations allowed them to exercise self-expression. Using their hands to shape play dough, control a paintbrush or work with small Lego pieces builds the children’s hand muscles, which enhances fine motor skills needed for future tasks like writing. 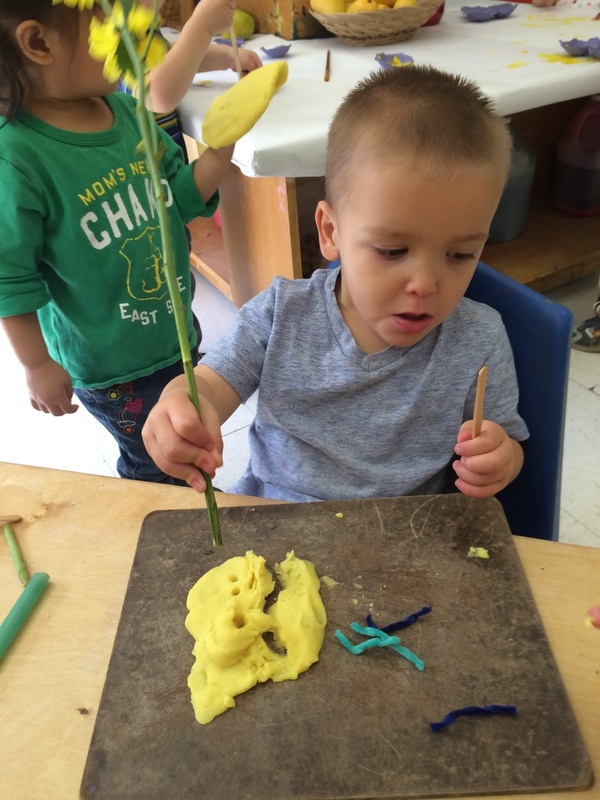 While working with play dough or paint may just seem like fun play to children, they are actually engaging in an important aspect of cognitive and behavioral development. 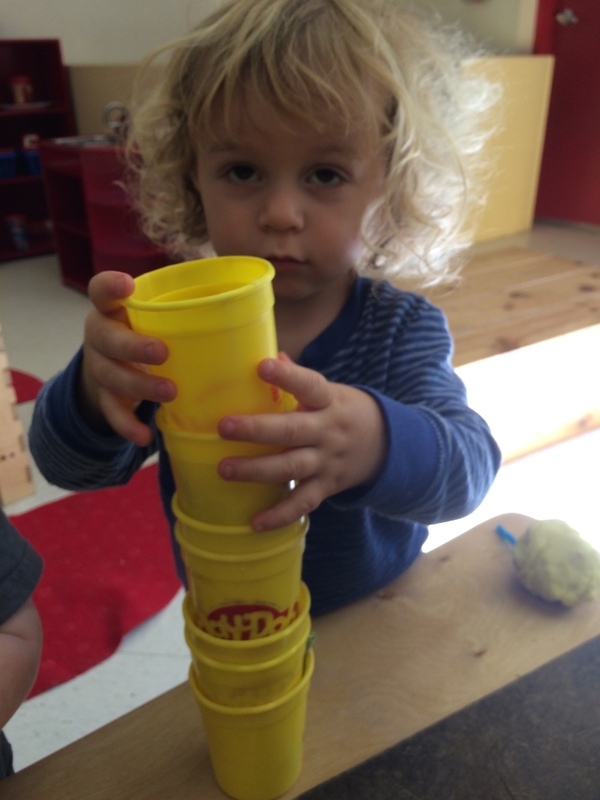 Children use modeling as a way to learn about the world around them. 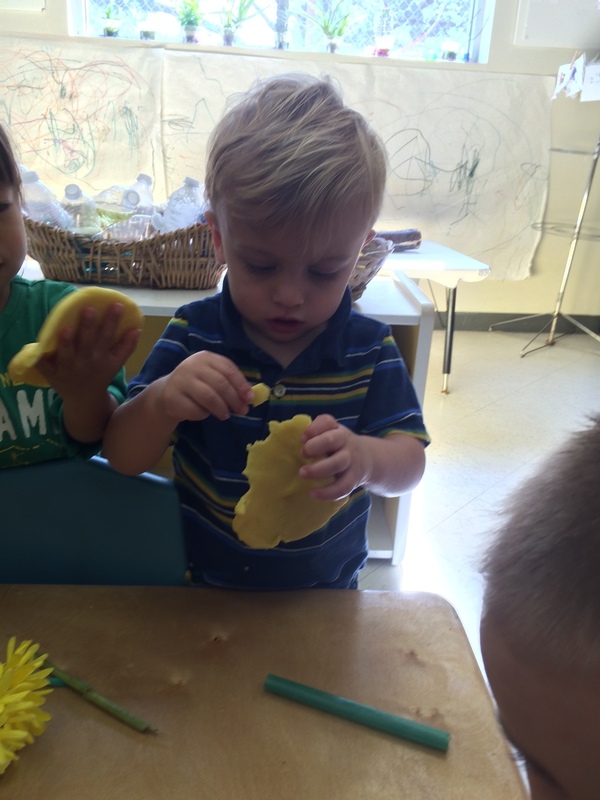 Creating a flower out of play dough requires the child to carefully study the flower. As a result, they learn a great deal about its shape, color, texture etc. Modeling also increases an understanding of symbolism and the ability to make connections between two objects while remaining aware of their separate identities. The students also explored mangos with Ms. Gabby during a Think Tank session and as their Food as Language. These encounters allowed the children to use multiple senses while making their observations. They tasted the mango, took in its bright color and felt the textural differences of its various parts. This experience fostered relationship-building opportunities and a sense of community as the children communicated with one another regarding the fruit and worked together to squish it between their fingers. They had fun exploring the different parts of the mango: outside, inside and seeds.